When your air conditioner breaks down in the middle of the summer, you could be facing an emergency situation. When the temperatures outside soar, it doesn’t take long for the thermostat to start rising inside your house. At Rowell’s Services, we offer professional air conditioning repair throughout New Hampshire, and we’re available 24 hours a day, 7 days a week for emergency service. Just like your car, regular air conditioning service will help maintain the life of your A/C unit. At Rowell’s Services, we recommend annual air-conditioning maintenance to keep your cooling system in prime condition. When you contact us, we’ll schedule a time to come out and carefully inspect the system and perform minor maintenance and repairs as needed to keep your AC running like it should. When you need AC repair in New Hampshire, look no further than Rowell’s Service. Our EPA-certified technicians are equipped to handle just about any cooling problem, and they will do so in the fastest and most efficient way possible. 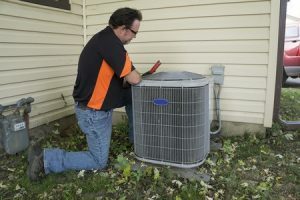 We understand how important a cool, comfortable home is to you and your family, and we will do our best to restore your system to good working order as quickly as possible. For air conditioning repair you can depend on, contact Rowell’s Services today. Call 603-934-4145.